A good program for the Western Horse Fitness will improve his athleticism, by strengthening his muscles while developing balance and self-carriage. Another important aspect is keeping him alert and happy in his job. Each training session should start with loosening and warming up the horse correctly before moving onto exercises which work different areas of his body. Jec Ballou is nationally recognized as an educator on equine conditioning and gymnastic development. In Western Dressage Exercise – Controlled Wandering, she stresses the importance of warming up the horse properly before asking him to perform more strenuous movements. She points out that when a horse is at rest only 15% of his blood flows to the muscles that move his limbs. During exercise this percentage rises dramatically to 85% as blood is transferred from his organs and metabolism to the larger skeletal muscles. This provides them with the power to move more energetically. But this transfer does take several minutes. The horse’s body first needs to be loosened up slowly and gently to increase the blood and joint fluid circulation. This will keep your horse supple and easier to ride as well as reducing his risk of injury. Your horse can also relax at the beginning of every ride, knowing that he has time to ‘chill’ before more exacting work is demanded of him. Ms. Ballou suggests riding your horse on the buckle when you first start out. She calls her system “controlled wandering” and it consists of moving leisurely around the arena “in creative loops and turns,” riding figures and patterns not normally included in your daily work routine. This phase should take five to eight minutes, but an older horse will benefit from even longer. After this, the rider progresses to the warm-up. Ms. Ballou emphasizes that this is a separate phase from loosening-up. Its purpose is to increase the horse’s body temperature and makes him suppler. Once your horse is moving happily forward, supple and ‘engaging his back’ he is ready for the day’s training routine. Mr. Rudin explains that bending your horse creates softness and suppleness in his entire body, which must be achieved before performing any other exercises. He should be ridden in a snaffle, with you sitting balanced in the saddle. Your contact should be the same in both reins: the inside rein bends the head and neck of the horse, and establishes the degree of bend. Your outside rein provides the outer limit of the bend to stop over bending. The horse should move between a channel formed by your reins. Figures of eight ridden at different speeds, sizes and gaits will stretch and supple your horse’s muscles and make them more flexible. He describes the leg-yield as “like a sidepass on the go” where the horse has to move sideways and forwards at the same time. It is more easily performed in walk and trot, but a well-balanced horse can leg-yield in canter. In addition to strengthening his back and hind end, this exercise loosens up the horse’s shoulders and his front end becomes lighter. The result is better balance and longer strides, and the horse moves with more expression. The leg-yield should be performed in a snaffle. 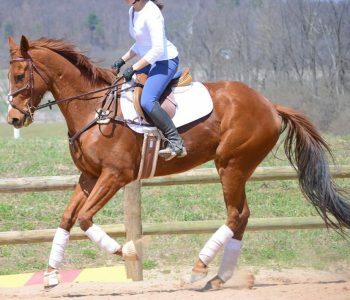 For a leg-yield to the left, ride your horse down the center line, flex his head to the right, keeping outside left rein contact, and nudge him over with your right leg just behind the cinch. His right front and hind legs should cross in front of his left legs while he moves forwards and laterally. Ask your horse for a gentle sideways line of travel with his body straight. If his quarters trail, stop the movement, straighten him out for a few strides, and ask for leg-yield again. The shoulder-in is another great way to strengthen and loosen up your horse, and make him more flexible. This movement shifts weight off his front end and transfers it to his hind end. The result is improved self-carriage, which is a pre-requisite for collection. Without collection your horse will be unable to perform – among other things – his lead changes. As Ludvik K Stanek explains in Collection: Balance/Energy, collection is achieved when the horse is in balance under his rider, who ‘collects’ his mount’s energy (containing it with his seat, legs and hands) thereby creating the impulsion the horse needs to perform difficult tasks with greater ease. Collection requires strength in the horse, and the shoulder-in targets the muscles he uses to achieve it. This is usually ridden on the rail. The horse shifts his shoulders inwards and moves forwards on three tracks. His inside foreleg is on one track, his outside foreleg and inside hind leg are on a second track, and his outside hind leg travels on the outside track. Maintain your horse’s bend, and bring his shoulders in by moving both reins inwards. In the beginning your outside rein will probably lie on his outside withers while your inside rein stays next to his withers. Your seat should be parallel to the line of his shoulders, your inside leg applies pressure on the cinch, and your outside leg is slightly back to keep contact with the center of his ribcage. Don’t make the angle of the shoulder-in too steep (otherwise the horse will be working on four tracks in a virtual leg-yield) and ensure that he stays bent round your inside leg to get the maximum benefit from this exercise. The Western horse needs to be athletic and strong, balanced and in self-carriage to do his job happily with the minimum risk of injury. 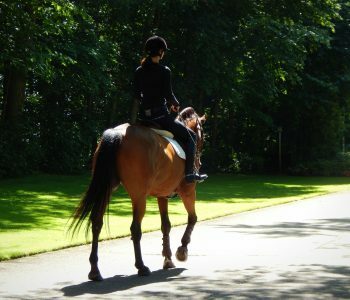 The above exercises will increase his fitness, enabling him to work efficiently in relaxed co-operation with his rider. The forwards riding position required in jumping “necessitates weight bearing to be through the rider’s legs,” according to a study of the physical demands on equestrian athletes. A program for condition the body for optimum show jumping performance must therefore strengthen the torso and legs as well as improving stamina for a jumper rider. Start with the pushup position, leaning on your forearms. Straighten the spine and pull in your stomach, then hold yourself up for 15 seconds, with toes and forearms touching the floor. Perform 15 repetitions, lengthening the time you hold yourself up as your fitness builds. Jo Jackson recommends trotting without stirrups. Cross your stirrups over the pommel of the saddle. Keep your legs in the correct position and ask the horse to trot. Ride in rising trot for as long as you can, with your heels down, just as they would be in the stirrups. Initially this will be tough to maintain, but you’ll gradually be able to perform this exercise for longer periods. A favorite among event riders, this exercise improves the rider’s balance in the saddle as well as strengthening the thigh and calf muscles. It also flexes the ankles. With feet in the stirrups, trot the horse while sitting in the forward jumping position. Look ahead, as if you were approaching a fence, without coming back down into the saddle. You’ll be able to sustain this for longer as your thigh muscles become stronger. Stand on the first step of a flight of stairs, with the balls of your feet on the edge of the step and your heels hanging over the edge. Slowly lower the heels of your feet until your calves are stretching, and hold for 10 – 15 seconds, then raise your feet above the height of your toes. These two exercises combined will strengthen your ankles and improve your balance. Showjumping riders should build their stamina with thrice weekly cardio exercises, according to M. L. Rose in Exercises for Showjumping. These should be vigorous and can include riding, but additional options are walking briskly, jogging, swimming, playing squash and biking. Showjumping requires good physical fitness. Strengthening exercises on the legs and torso will improve your balance and stability in the saddle, while stamina training will enable your body to compete without becoming stressed. Always consult your physician before beginning any exercise program to make sure you can safely perform an exercise program. A show jumping horse faces multiple physical challenges: he needs sufficient speed and stamina to navigate the course, explosive take-off power, and good technique over fences. 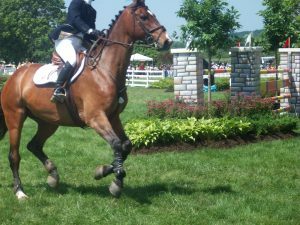 To be successful, a conditioning program for the show jumper has to address the horse’s overall strength and fitness while improving his jumping style. The first stage is aerobic training, where the horse’s heart, lungs, muscles and other soft tissue are slowly strengthened. Mark Sellers quotes Hilary Clayton, a professor at the College of Veterinary Medicine at Michigan State University, who says this phase can last between 6 and 12 months before the young horse is ready for the next stage, which is anaerobic conditioning. For the older, trained horse, regular jumping can be incorporated into the later part of this phase. The young horse should be introduced to obstacles once his aerobic and anaerobic training are complete. 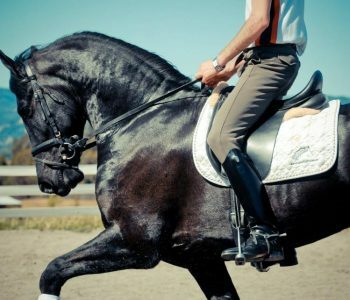 When they also incorporate correct flatwork, both types of conditioning build his muscles properly and bring his body into balance under his rider. Being ridden at working trot and canter form the exertion part of the horse’s aerobic training, while walking serves as his rest period. Professor Clayton recommends a work to rest ratio of 1:2. Ms. Whitaker advocates “plenty of trot work to improve overall fitness and also to build up muscular strength.” She adds that “hill work is great for building the hind quarters,” and stresses the importance of riding in a correct outline all the time to work the right muscles, even when out on the trail. The horse is gradually asked to travel over greater distances, while keeping his heart rate lower than 150 bpm. This phase develops the horse’s lung capacity and teaches his body to utilize oxygen more efficiently. After approximately one month of aerobic work, the horse moves onto anaerobic interval training. A study on the effects of interval training on show jumping horses concluded that while all types of interval training “improved parameters of fitness,” the gallop and jump interval exercises were more beneficial than bouts of sprint work. Interestingly, the gallop work improved the horses’ jumping techniques just as much as actual jumping did. Ms. Whitaker includes gymnastic jumping in the anaerobic phase for “improving fitness, rhythm and co-ordination.” In gymnastic jumping the horse goes over a line of jumps and ground poles in various configurations. This is an excellent way to build the horse’s confidence over fences, whether he’s had time off or is just beginning his show jumping career. It is important not to over-jump the horse. 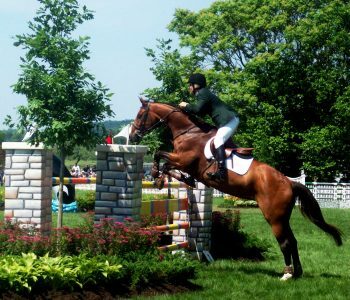 Training over obstacles for approximately 20 minutes at a time, twice a week, should suffice “to develop your jumping to the required standard” and allow time to practice over a full course of fences. The horse must be properly schooled on the flat, able to accept the rider’s aids, forward going and straight. He is not ready to jump until he is balanced underneath his rider. Cantering over the obstacles is introduced only when the horse’s back and hind legs have developed sufficient muscle. There is no set time period for conditioning the show jumper: each horse has individual requirements. Some horses need more time than others to get fully fit, and their training must be adjusted accordingly. Setbacks are inevitable: your horse may injure himself or the weather may not co-operate with your intended schedule. Prepare to be flexible with your competition calendar should your horse not be ready for the show you originally planned for him. Whether bringing a seasoned campaigner back into work or starting a young horse, it’s important to start with aerobic exercises to strengthen the horse then progress to anaerobic work to prepare him for producing sudden bursts of power. Together with practice over fences, this methodical approach will afford him the best chance of success in his show jumping career. If you haven’t ridden before or are switching disciplines, you’ll find the rigors of dressage much easier with targeted preparation. Swimming and cycling are excellent ways of achieving the necessary physical fitness. But you can gently condition specific riding muscles and improve rider symmetry in your own home. A dressage horse should travel straight. But equines are naturally crooked, and we often exacerbate this, because our horse reflects how his rider is sitting. If we sit crookedly, he has to move awkwardly to compensate for our lack of straightness. Like horses, humans tend to have a dominant side. If we are right-handed, this translates into being ‘right-legged’ when we get into the saddle. We sit to one side, exert more strength with our right hand and leg. Meanwhile our left sides are weak and ineffective. Jon Pitt has developed exercises for discovering your dominant side and training your body to become symmetrical. To simulate the horse, he uses a Rider Stability Ball to develop the balance and core (torso) strength so essential for good dressage. You can use any exercise ball, such as the inexpensive ($10) Gold’s Gym 55 cm Anti-burst Body Ball, also available in 75 cm, or Tone Fitness 65cm Anti-burst Stability Ball. Recommended sizes are: 55 cm ball for those 5’7” and under, 65 cm ball for those 5’8” – 6’ and 75 cm ball for those 6’ and over. 1. Sit on the ball with your legs in front as if you were on a chair, and raise one leg off the ball. 2. Replace that leg and raise the other one. First, you automatically raised your weaker leg, and have now raised your dominant leg. The weaker one is having a harder time supporting you. Practice this to strengthen your weaker leg. Relaxed, open hips allow the horse to move freely under the rider. 1. Sit with your legs on either side of the ball, as if you were on the horse. You’re now opening your hips and adapting them to a wider angle. Since you’re not actually on a moving horse, you can be more relaxed and your hips won’t stiffen. 2. If you’re new to riding, don’t stay too long in this position. Start for 30 seconds or so, and increase the time every other day, to allow your muscles to recover between sessions. This exercise teaches the rider to move the pelvis with the horse’s motion, and develops correct posture in the saddle. 1. Still in the riding position, tilt your pelvis forwards, ‘closing’ your belly button. 2. Then tilt it backwards, creating a hollow, arched back. 3. We riders tend to sit in one of those extreme postures, but the ideal position is in between. Practice keeping your torso straight, but not rigid. Sit centered on the ball and take your feet off the ground. It’s tricky to do at first, but over time you’ll be able to keep your upper body straight while your pelvis moves under you for balance. Practice these exercises every other day to help build correct muscle strength and achieve symmetry in the saddle. By developing a soft, independent seat, you’ll allow the horse to move forward with freedom, straightness and balance. This is the hallmark of a good dressage rider. All equine fitness training should be carried out slowly and with consistency, and this is especially true for the dressage horse. In her excellent book Equine Fitness, Jec Aristotle Ballou stresses that it can take as long as 12 months for a horse to become fit enough to be ridden in walk, trot and canter for a full hour. And yet most riders expect their horses to perform this long after only a few months. Schooling a horse may teach him dressage movements, but it doesn’t improve his physical ability to perform them. Without incorporating proper strength and conditioning exercises into every work session, your horse will never become strong enough to go up the levels of dressage. Instead he will become stiff with tight neck muscles and a weak back. Ms. Ballou believes in the 50/50 rule for every session. Half the time should be spent on schooling and the other half used for conditioning work. When conditioning the completely unfit horse, allow 4 months as a minimum and up to 7 months. Think about how much time you’d need to get into shape if you were starting from zero fitness! A horse is no different. If a horse has not been ridden for a long time, start with exercises on the ground for a couple of weeks. Calisthenics such as backing the horse uphill (beginning with a few steps) coupled with leg and neck stretches are useful. If you have access to a horse exerciser, you can warm him up on it before you begin his stretching program. Dr. Woodford advocates starting slowly and gently. Never force the horse to stretch if he resists: “Simply stop and ask again.” Overdoing it can injure him, so don’t go beyond what he’s comfortable with. Stretching exercises are a good way to improve the flexibility of your horse over a period of time. Dr. Woodford’s instructions for neck stretches, front and back leg stretches and back stretches are accompanied by photos. Perform these for 10 to 15 minutes on alternate days for at least 3 days a week, then start riding for 25 minutes at a time beginning with walk. Every 10 days gradually increase the duration and intensity of the exercise. Add short trot sessions after the first 10 days, and finally some canter after the second 10 day period. 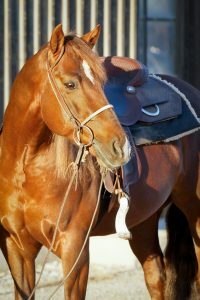 You will begin to notice your horse shedding his extra pounds and becoming more muscled. The basic cardio workout for your horse usually takes 4 weeks but can require 12 weeks or even longer. It focuses on building stamina, so plan to ride 4 or 5 days per week. This avoids the problem of lactic acid building up in the muscles, which adversely affects the horse’s performance. In Is Your Horse Fit for the Task? Ray Geor, BVSc, PhD, Dipl. ACVIM explains in detail how to assess your horse’s fitness level. This will tell you when your horse has completed his cardio conditioning program. Ms. Ballou emphasizes that your horse should “carry himself properly in the correct posture” by the end of this phase before moving onto the strength-building exercises. He must be “stretching his back, pushing nicely with his hind legs and carrying his spine in good balance.” Then he will get the most out of his conditioning and strengthening work. By now you’ll be schooling your horse in dressage for 2 to 3 days a week, devoting 1 day to maintaining his cardio-fitness. It’s now time to add strength training for an additional 2 days a week. Interval training works well for the dressage horse by having him perform “different types of exercise on successive days and by allowing easy days between strenuous workouts.” This avoids specific muscles being overloaded and causing injury. The report suggests a ratio of work to recovery time of between 1:5 and 1:6. After executing high-stress dressage movements, the horse recovers by performing easy or suppling exercises for five to six times as long as he worked hard. This allows the heart and lungs to partially recover, while dispersing some of the lactic acid build-up. Hill work: walking and cantering uphill (not trotting) as work, then walking back down for recovery. Gymnastic jumping over fences of 18” – 24”: jumping a grid of bounces or one strides (work) and walking or trotting back to the start (recovery). Repeating dressage movements which require strength, such as the canter pirouette, for a short time, followed by trotting on a large circle while suppling the horse with shoulder-in or travers before repeating. You could perform this on alternate days, three times a week, adding more intensity/repetitions to the exercise each week until the horse is strong enough to perform the required repetitions of that movement. You will have now reached the phase in your horse’s conditioning where you simply need to maintain his fitness level. Ms. Ballou advocates riding for at least 3 days a week, but preferably 4 or 5, to achieve this. At the same time stick to the 50/50 rule of working half the time on your dressage movements and the remaining half on your horse’s conditioning. This will lead to a fit horse that is able to fulfill his athletic potential. This excellent book contains exercises for achieving total fitness in your horse. Is Your Horse Fit for the Task? Owners often worry about the safety when using exerciser machines. If you choose the right machine and take sensible precautions, you can enjoy its many benefits without injury to your equine partner. Here are 10 safety tips for horse exerciser safety. The European type of horse walker, such as the EuroXciser, is a safer alternative than the traditional version. The horse is not tethered, with his head held in an artificial position, which can result in injuries to his back and his hocks. He can’t get hung up on his lead rope and won’t feel restricted or try to break loose by pulling on it, stalling the machine and upsetting his equine companions. Because he is allowed to move naturally and with freedom, he relaxes quickly into his exercise routine, and develops more correct muscling. Choose a horse walker that offers a generous amount of space for the horse to move in. With a machine such as the EuroXciser each horse has a work area of at least 30’ or more in length and 8’ in width. These measurements prevent him from feeling claustrophobic and panicking, and he has plenty of room to turning round in when you change the direction of rotation. Particular attention needs to be paid to the construction of the outer and inner walls of the walker. They should be high enough to prevent the horse from being able to jump out, be very strong, and have no gaps big enough for him to get his legs, hooves or head stuck. Here are examples of safe fencing, with the added advantage that individual panels or planks can be easily replaced. The dividing partitions between each horse should have no areas where a horse’s hooves (or any other part of his anatomy) can get caught. Lightweight and easily removable metal frames containing wire grids and a rubber base are ideal. A good example is the EuroXciser partition: horses are not only physically safe between them, but can also see their equine buddies on the walker and relax. These frames can be connected to a fence charger, which is extremely useful if you have horses which persistently lean against the back panel and disrupt the work flow. Another safe choice of partition is neoprene rubber, perforated to allow air flow and reduce overall weight. They are soft on flying hooves, but their one disadvantage is that they cannot be charged. Especially for a horse not use to an exerciser, or of a nervous disposition and easily upset by loud noise, a quiet engine is a real bonus. Using a inline geared motor allows for whisper quiet operation, and not agitate a horse with unfamiliar noise. These type of drive trains also more reliable and require little maintenance. An emergency stop button on the outside controller is essential. Knowing the walker can be stopped immediately if necessary will gives you additional peace of mind. In order to relax in his work your horse must feel secure and comfortable going round the track. One of the biggest ways to keep him safe on the horse walker is good footing. You never want to exercise your equines on a concrete surface. It’s easy for them to slip on, is hard on their hooves and can cause severe concussion injuries. Concrete becomes even more dangerous when covered with droppings or rained on. The footing you choose should provide sufficient traction and absorb impact. Excellent choices include soft sands with rubber additives. Rubber mats underneath the footing add extra cushioning. They should allow adequate drainage and be properly secured so they don’t move under the working horse. Regular clearing of manure and other debris from the track keeps it clean and safe for horses to work on. No matter how good the footing, your track will lose its ability to absorb impact if it becomes worn. At this point your horse will derive considerably less benefit from being on the walker and may even suffer injury to his ligaments and tendons. For your equine partner to stay safe on the exerciser, drag your track regularly. This will level out the footing again and retain the correct mixture of materials, if you’re using more than one. A certain amount of moisture in the footing will maintain its ability to absorb impact. It also reduces the quantity of dust produced by the horses as they go round the walker, and keeps them safe from respiratory problems caused by inhalation of the particles. A good proportion of water to footing volume is 5% – 10%. How you introduce your horse to an automated walker plays a big part in how well he’ll take to this form of exercise and will affect his safety. He should not be placed in it alone: put one or two equine pals on there first. Then allow him to watch them quietly go round before you lead him into an empty partition behind a horse he’s comfortable with. Accustom him to the machine in walk, and take your time teaching him how to turn around when it stops. Don’t leave him on it alone after his work session, and take him off before removing his friends. It is less risky if the horse doesn’t wear a halter on the free-style exerciser. Just as it is preferable not to leave him in the paddock with one on, it’s a smart safety measure to remove his halter as he goes into his space in the walker. Wearing a halter may make him easier to lead off the exerciser initially, but once he’s used to it, he’ll soon let you put it back on when you want to take him out again. Horses should never be left on the horse exerciser without someone keeping an eye on them. This ensures that immediate assistance can be given if an emergency should arise. Place the walker where you can see it as you go about your daily horse business. The horses will also find their sessions more interesting if they can see activity going on around them, and they won’t feel abandoned on the walker. Plus, you won’t forget they’re on there! Taking these precautions will help keep your equine safe on the horse exerciser and allow you to take advantage of the many benefits this machine has to offer. Anyone accustomed to using a horse exerciser will tell you how lost they would be if they suddenly had to do without one. 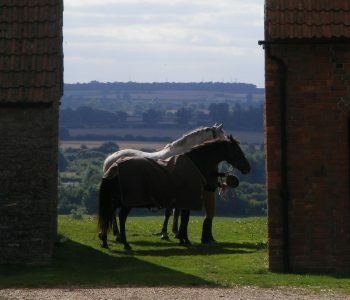 Horse exercisers are a huge asset to horse owners, trainers and breeders alike, with some barns running theirs all day. 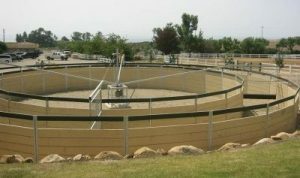 A company such as EuroXciser offers many different types to help you choose the best one for your particular situation. Once installed, your new machine will quickly become indispensable, as you discover more and more ways to incorporate it into your daily horse management. At facilities with restricted pasture land, especially in less rural areas, a horse walker affords animals the opportunity to get out of their stalls and stretch their legs every day. This gentle exercise prevents them from having to stand for hours in their stalls. It provides controlled, sustained movement, increases their circulation, reduces boredom (with its associated vices) and helps maintain fitness. Many barns don’t turn the horses out when it’s raining because they churn up the grass. An exerciser, especially a covered one, is a great solution for horses that are stall-bound during poor weather. Working in a safe environment, they can get rid of excess energy that’s usually released in the field, making them better behaved under saddle. Another benefit of the walker is that it gives the horse owner an alternative to fitness work on slippery roads during periods of rain, sleet or snow. Sometimes an owner simply doesn’t have time to groom and tack up the horse, warm him up, ride for an hour and cool him off, then unsaddle the animal and brush him down. It takes much less time to put him in the exerciser where he can get a good workout without his owner feeling guilty about not spending longer with him. For those with more than one horse, a great advantage of the walker is its capability to exercise several animals at once. Machines are built to accommodate between 4 and 6 horses, and exercising them together reduces the time required by barn staff to work them. Walk work is an important part of the initial training of horses for disciplines such as endurance or eventing. The horse exerciser is extremely useful during this phase. Later in the program it won’t replace undulating countryside or rough terrain, but instead becomes an invaluable aid in warming up the horse before his more strenuous work and cooling him off afterwards. Adding trot laps helps maintain fitness and keep muscles toned. Horses coming off stall rest after an injury can be safely reintroduced to work in the controlled environment of the exerciser, rather than dragging their handler while being led on foot, or bolting and bucking under saddle. It is a gentle way to bring them back into an exercise routine without the burden of a rider. Once you’ve chosen the right style of horse exerciser for your barn and placed in an easily accessible location, you’ll soon wonder how you ever survived without it. Adopting a horse is an exciting prospect: it can lead to a special equine relationship that lasts for many years. Here are 6 tips to help in a successful horse adoption of a rescue horse. Make sure the rescue organization is trustworthy. Talk to people who’ve adopted horses from that facility to see whether the match was a good one and check it against the points in Reputable Rescue or Shameless Scam? by Jennifer Williams, PhD. She covers seven crucial areas to research which include: how well the horses are kept; the accessibility of information about the operation, its experience, personnel and the horses in its care; its reputation within the local law enforcement and general community, and the soundness of its adoption policies. Don’t fixate on a particular breed, gender or color. Much more important are temperament, any behavioral issues and whether the horse is able to fulfill the function you require. You don’t want to adopt a horse only to find that you cannot afford to keep him and have to give him back. If you don’t currently own a horse, talk to the rescue organization to get a realistic assessment of what you need to budget for your new equine. The adoption fee is only the beginning! Looking for a rescue is best not undertaken alone. You need a dispassionate and competent horse friend or trainer to accompany you when you check out prospective candidates. “A trainer will look at a horse with his brain and his eyes, not his eyes and his heart,” says Jose Castro, DVM, Dipl. ACVS, ABVP, clinical instructor for equine field services with the University of Tennessee’s Large Animal Clinical Services. Your sensible companion will make sure you don’t fall in love with an unsuitable horse. 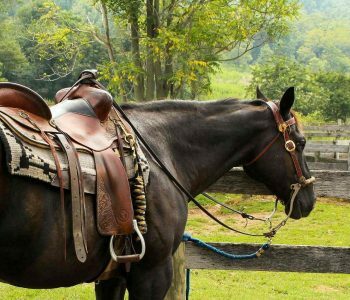 Your prospective new horse will likely have undergone some training while at the rescue facility, but, as indicated above, will need you to continue his education after you get him home. If he was abused, he may have trust issues. Talk to the rescue staff about how they were overcoming them and to what you need to do to gain his confidence. Adoption is a potential win-win situation for both horse and owner. By following a few simple guidelines you can find the perfect horse and form a unique bond with him that more than repays you for the chance you were willing to take on him. Reputable Rescue or Shameless Scam? Why Adopt a Free Horse? Should You Consider Adopting a Rescue Horse? Thousands of horses in rescue facilities are in desperate need of a loving new home, and you’d like to give one a second chance. There are many benefits to adopting a rescue horse, but how can you be sure it’s the right choice for you? The following information can help you determine whether adoption is the best way to find your new horse. A reputable rescue operation will be anxious for its horses to go to the right person. 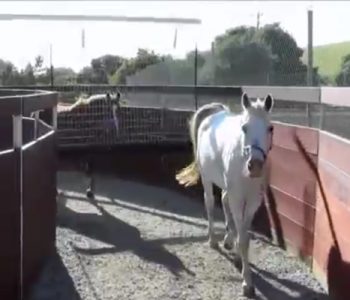 The animals have been through a lot of trauma already, and the facility won’t knowingly send an equine to the wrong home. It’s not in the best interests of the horse or the reputation of the rescue group. If, despite the organization’s best attempts to match you with the perfect horse, the relationship doesn’t work out, you can return the horse. In fact, adoption rules usually insist on your giving the animal back in the event you don’t want it or can’t keep it any more. This is a huge advantage over buying a horse from a dealer or private owner. Sellers sometimes ask for right of first refusal, but most leave you with the burden of finding the horse a new home if you and he don’t get on. Rescue horses are handled and, where appropriate, worked for several months before they are put up for adoption. This affords the operation plenty of time to assess the type of home he should go to. Being keen to place horses with appropriate homes, rescue management will be honest with you about the horse’s temperament, state of health and the job for which he is suited. You will be made truthfully aware of the horse’s history to the best of their knowledge. Reputable facilities not only carry out thorough health checks of their horses, they also give them all their vaccinations, float their teeth, trim their hooves and provide a negative Coggins. You should also receive contact information for those who have cared for the horse in the past. Many of these horses have suffered terrible abuse and neglect through no fault of their own, and deserve to find a forever home where they will be appreciated and well taken care of. If you do find the right rescue horse, you’ll feel wonderful about giving him a new lease on life and the bond you form with him will be extra special because of his background. If you find a horse that you think will suit, but are still on the fence about adopting him, most facilities need foster homes for their horses. 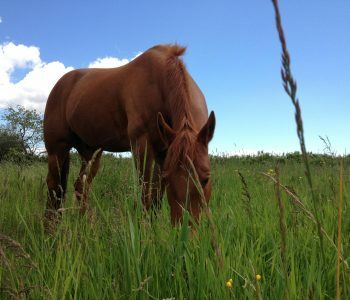 Offer to foster a horse and take the time to find out if he’s the one you are looking for. 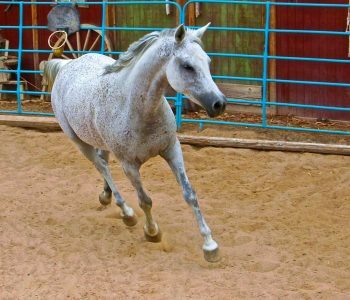 Some rescues, such as Angels Haven Horse Rescue, offer pre-adoption leases for this purpose. It is a great way to try out a horse, without feeling bad if you don’t gel with him. Rescue horses often have health and/or behavioral issues. They need an experienced horse person to handle and retrain them and a rookie rider is not the person to do this. Katherine Blocksdorf explains this in her article, Buying a Rescue Horse. A beginner is likely to run into problems which can lead to a dangerous situation. Such horses are best left to more seasoned equestrians. Beware of falling in love at first sight with a rescue horse or feeling sorry for him. This is the quick path to acquiring an unsuitable horse. Take a sensible horse person with you to stop you doing this! The rescue staff will try to keep you on track, but a friend or trainer whom you trust, who knows your temperament and how well you ride, is the ideal companion to bring along to your appointment at the rescue facility. Even if you’re an experienced horse person, you need to be sure that you have the skills to deal with any behavioral problems your new horse may have. He will have undergone rehabilitation at the rescue barn, but will likely need you to continue working on his issues. Take the time to watch him being trained by the rescue staff, ask lots of questions, and be honest about your own ability to deal with the horse you’re interested in. There are many advantages to adopting a horse. You’ll receive plenty of information and support from the rescue organization, which is keen for you to have a successful relationship with your new equine. And you can return the animal if things don’t work out. Once you do find the right equine, the rewards will be huge – for both of you. Characteristics of relinquishing and adoptive owners of horses associated with U.S. nonprofit equine rescue organizations. When your frightened horse is scared of working with other equines, communal riding areas become cause for panic and competition day becomes a nightmare. Especially if you’re an amateur riding facing this problem, here is the method I used for overcoming my horse’s fear of oncoming equines. It also works if your animal is afraid of horses coming up from behind or getting too close for comfort. You will need: an enclosed riding arena and a couple of patient riding friends. When your horse is completely relaxed at his current step, move to the next one. Lead your horse into the middle of the arena while your two friends ride around in walk. Stand there for a few minutes. Once your horse is calm, lead him around on the innermost track while the other two walk in both directions on the outside tracks. Continue walking while they trot and canter around him in both directions. Have a friend ride in walk beside you in the same direction. Now walk in opposite directions. Switch between the outside and inside track. Some horses (like mine) are afraid of being ‘pinned’ between the outside rail and oncoming horses. Trot in both directions (inside and outside tracks) while your friend stays in walk. Now have her trot in both directions, too. Her horse will sometimes be trotting to towards you, so use lots of shoulder-in to keep your horse focused on you. Stay calm and believe in yourself. When your horse can handle this, add canter. Ride between the two horses, with all three traveling in the same direction at walk. Walk on the inside track, with the other horses walking in the other direction towards you on the outside tracks. 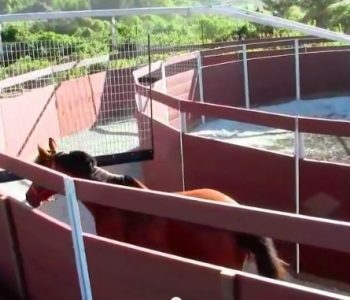 This gives your horse ‘escape space’ in the middle of the arena. Now walk between the oncoming horses, while they give you a wide berth. When your horse is comfortable with this, have him trot between the two oncoming horses while they continue walking. Trot between the two horses as they trot towards him and give him a wide berth. Drive your horse firmly forwards if he wavers and lead him to his ‘escape area’ just past them. Canter between the oncoming trotting horses. Again, be firm in directing your horse forwards. Finally, canter strongly forwards between the two oncoming cantering horses. Each step may take several days or even weeks. Patience is key. My own horse was so scared of oncoming animals in the warm-up he’d try to rear. After going through the above program he now works in the warm-up arena at competitions like a real pro! If your horse is worried about being ridden with others, you can use the above plan to show him you are the leader on whom he can rely. Eventually he’ll realize he has nothing to be afraid of with you there to guide him.